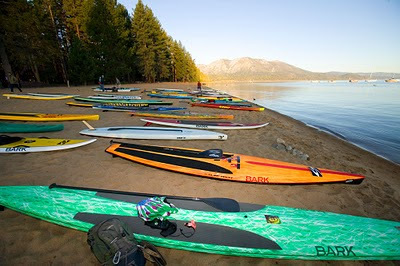 Huge developments in SUP race boards are expected for the 2011 Race Season. Perhaps none larger than the debut of the Surftech 14' Joe Bark Dominator. 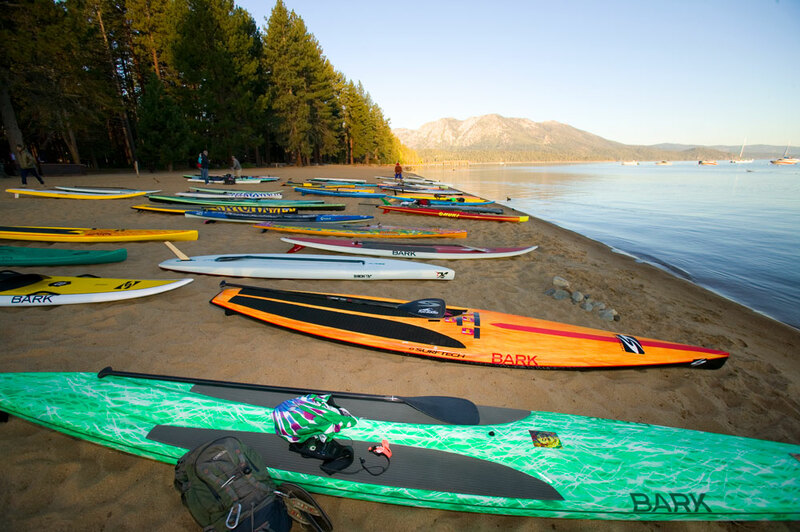 If you attended a single SUP race last summer, you probably noticed that seemingly one in five stock boards was the Surftech 12'6" Bark Competitor. 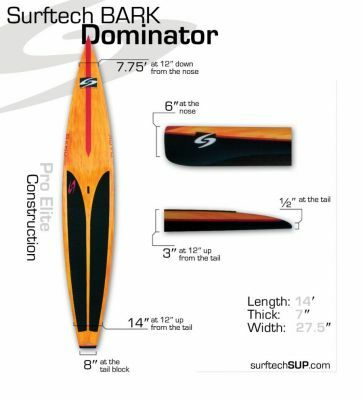 Well, the 14' Bark Dominator promises to be the board in the 14' class in 2011. We've had the opportunity to test paddle the board in a variety of flat water and ocean conditions and can tell you - - this board moves! The Dominator provides remarkable glide, especially noticeable was the sustained glide between the exit and catch paddling phases, due to the extremely slender displacement nose and efficient transition into nearly perfectly flat bottom rocker. Yet the Dominator exhibits the same high stability that made the 12'6 Bark Competitor the sport's most popular race board last summer. I suspect that the influence of the Dominator is going to really grow the numbers of people racing in the 14' class. Those of us who have raced in the 12'6 stock class have all experienced the frustrating feeling of watching the 14' class rather quickly pull away from the pack in the first mile or two of the race. Its only natural that more people are progressing to the fourteens - especially for longer races and point-to-point races. Chuck Patterson expressed similar views in his recent interview on SUP Connect. The 12'6" will always be a popular class however, and are a natural for buoy races and surf zone races like the Battle of the Paddle. As a result, the Pro-Elite Dominator is very light for a 14' racer at about 26 pounds (including fin and traction pad), however are more fragile as compared to Surftech's bulletproof Turflite construction. Both the 12'6" Competitor and the 14' Dominator will be available in Pro-Elite in 2011. There is an extremely limited run of the Dominator coming out in mid-December which has already been snapped up by dealers on pre-order. Covewater Stand Up Paddling Santa Cruz is among those select shops, and will be receiving a few of the December pre-orders. Additional Dominators will be available in early 2011. To pre-order your Dominator, give Covewater Santa Cruz Stand Up Paddling a call at (831) 600-7230. Dominators will be sold on a first come/first-reserved basis. Highly recommend checking out the Covewater shop if you're in the Santa Cruz area. I was able to do so last weekend. One of the few places I've seen where there's a good selection of quality performance shapes available for demo. Nice boards, nice people.